If you have a music lover in your family, your go-to present might be a couple of vinyl records or an iTunes gift card followed by an apology that you couldn’t afford a Telecaster. No biggie — the music nerd in your life definitely loves drowning in song, but in case you’re looking for more ideas, we’ve scoured the internet for 30 awesome gifts in all different price ranges. From inexpensive coffee table books to high-tech speakers, we covered the bases so you don’t have to. But if the stress of shopping isn’t for you, we lay out a couple of fun handmade gift ideas too! This isn’t your typical card game. There’s no trivia component here that’ll have players sweating. Instead, everybody gets to match their favorite songs to cute prompts (first kiss song, best summer song, etc) and choose the best fit after listening to them all. It’s the perfect game to share the soundtrack of your life. These beautifully illustrated playing cards feature tons of popular artists — from Bowie to Gaga to Hendrix and more — with each motif focused on a specific genre (the heart cards are for pop cuties). Makes your next Sunday night card game extra fun. This New York Times bestseller captures all the best of rap, tracking the top rap songs from every year since 1979 with thoughtful discussions and cool illustrations. Plus, Ice-T wrote the forward! Another awesome book for the coffee table, this one walks you through a collection of rock album covers from the 1960s to the 1990s, celebrating an underappreciated art form. Chances are the music lover in your life goes to tons of concerts. Seeing live music is always a special experience, so help them preserve those souvenir stubs with this collector’s book (works for movie tickets, sporting event tickets, and more, too). This badass company has two quirky cookbooks to choose from (rock or hip-hop), each of which features thirty recipes inspired by the artists we all know and love… rolling scone, anyone? This awesome journal boasts tons of creative music-related lists (from your top 20 favorite albums to your list of make-out songs) you get to fill in after scouring your Spotify library for hours. The illustrations in here are beautiful too. With 200 cards asking questions about pop, rock, movie soundtracks, and 80s hits, this is the ultimate trivia game for music nerds. This smart subscription service introduces brave music fans to new artists with a range of items you can purchase from CD compilations to t-shirts to stickers and more. Written by beloved NPR music expert Bob Boilen, this book features love letters from musicians to the music they adore. It’s a remarkable history of the industry’s favorite songs. These sleek, high-tech headphones have full Bluetooth capabilities, allows for hands-free talk, has comfortable cushioned design, and can be folded up for easy travel. They come in six other colors, too, but keep in mind that prices vary. This absurdly adorable suitcase turntable isn’t just pretty to look at — it’s a three-speed record player with built-in Bluetooth capabilities, plus it’s easily portable. There are tons of color options available but prices vary. This elegant black-and-white scarf is printed with handwritten sheet music of two classical music options so your favorite music nerd can look cute while they’re spouting random information about Beethoven to hordes of mystified listeners. Made specially by an artist in the UK, these prints are customizable by favorite song so you can hang up a stunning piece of art based on your favorite music. Featuring 64 famous guitars from rock history, this infographic is not only illustrated with eye-catching detail, but it’s also a cool conversation starter for music lovers of all ages. This comprehensive book serves as a remarkable source of information on the single most prominent and prolific music magazine of all time. These wall-mounted bottle openers are made from real vintage vinyl records — you can choose from rock, soul, country, or 80s, but the artist and song will be randomized. Definitely a cool piece for the kitchen… or your bedroom. This set of six glasses features super cute, colorful mixtape illustrations. The best part? The set comes with a wax pencil so your guests can write their name on the tape and keep track of their glass. Wall decor makes or breaks a room. With this cool clock made from a vintage vinyl record (your choice of jazz, soul, 80s, or rock), you can’t go wrong. Welcome your friends and family with this cool piece. The design is awesome, but it’s even better because you get to customize the title text! 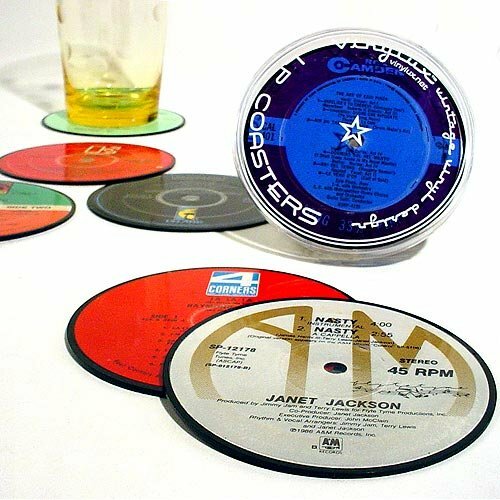 Be a good host (and avoid coffee table rings) with these vinyl record coasters. They’re not just designed to look that way — they really are made from real records! One set includes six coasters from a variety of artists. For the music-loving chef or baker in your life, these measuring spoons are adorable in their music note shapes! This brilliant product allows you to store your vinyl safely but display it proudly on the wall. Each frame opens for easy access which means you can switch your records out whenever you want. Frames come in white or black (you can even buy a three-pack which ends up being a better overall value). Buy your favorite music lover a three-month experience with a subscription to this service that sends members one exclusive, specially curated record a month (plus some extra digital goodies). Just like that doormat we mentioned above, this fluffy pillow features a cute mixtape design — you get to personalize the title… on both sides! Shaped like your choice of piano, guitar, or violin, this gorgeous serving board is handcrafted from Nova Scotian yellow birch and accented with pewter details. It’s a stunning piece that deserves the kitchen spotlight. This elegant and minimally designed ottoman isn’t just an ottoman. 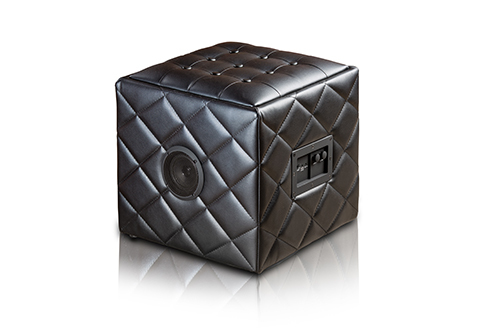 It’s a speaker that can be hooked up to your Apple or Android device to play your favorite music while you relax. With Amazon Alexa voice control power, smart processor, humidity resistance, and the ability to play music, pair with your stereo, and access iOS airplay, this speaker is a godsend for music lovers. The ultimate music player, this gorgeous piece features a 3-speed vertical turntable while also offering the wireless experience for Bluetooth music capability. It’s an intense all-in-one device that’ll light up any room it’s in. CD Cover Jewelry: If you’ve got the creative chops we lack, consider creating one-of-a-kind jewelry by printing (super small versions of) album covers and pasting them onto thick, durable cardboard rounded into a CD shape. You’ll need to punch holes and purchase earring hooks to be looped through them, but it’s a relatively inexpensive way to create a sweet homemade gift for music lovers. DIY Earbud Case: This crazy awesome idea from Penny Pinchin’ Mom has you repurposing a mint case into a handy-dandy earbud container. You’ll just have to cover the top using mod-podge with any kind of scrapbook paper and then personalize it in any other way you want. Easy peasy. Musical Photo Collage: If the music lover you love spends half their life going to concerts, you probably can’t go wrong with the sentimental route of creating a collage full of music memories. There are tons of ways you can do this, but we suggest either purchasing a small corkboard then tacking on pictures, ticket stubs, band stickers, and more for a sweet display, or you can do the same thing but keep those memories preserved in an elegant shadow box. DIY Record Box: Premeditated Leftovers came up with this brilliant and super easy way to store vinyl records. You’ll need to measure out the exact space you’ll need for the final product as determined by record size, cut and assemble the wood, then paint it however you’d like. This one might be a little pricey, but the result will be beautiful. Favorite Album Book: Chances are your music-loving pal already owns their favorite albums, but another way for them to show love to music is by keeping track of each one in a scrapbook. The assembly is quick and easy, but you can take any additional steps you’d like to personalize it. All you have to do is purchase a scrapbook, print out the covers of your friends’ favorite albums, paste one on each page, and write a fill-in-the-blank info section on the back of each one. You can include things like album name, artist name, date released, genre, etc, but make sure you leave plenty of space for your friend to write out all the reasons they love each album! It’s sort of like a baby book or that Listography book we mentioned in our gift guide above, but it combines some extra creative elements, acts as an art project for you, and affords a fun customizable experience for your friend. Okay, we’re out of ideas, but hopefully any of those 35 above will make its way to the music nerds you love one day. Think we’re missing some good ones? Let us know in the comments or tell us which ones you’re dying to get! Dec 1 Exclusive: Holly Rees Bares All on Tender Acoustic Single "Stick Around"